Oh boy, Hangouts 4.0 is official and rolling out today on Android. Google decided that Monday morning would be a great time to announce the big news and we couldn’t agree more. The update introduces Material Design to the app, makes it simpler with a FAB compose button, allows you to attach pictures and stickers and fun things easier, and should be faster all around. Outside of the design, Google added in group MMS in Hangouts using Google Voice(!!!!). 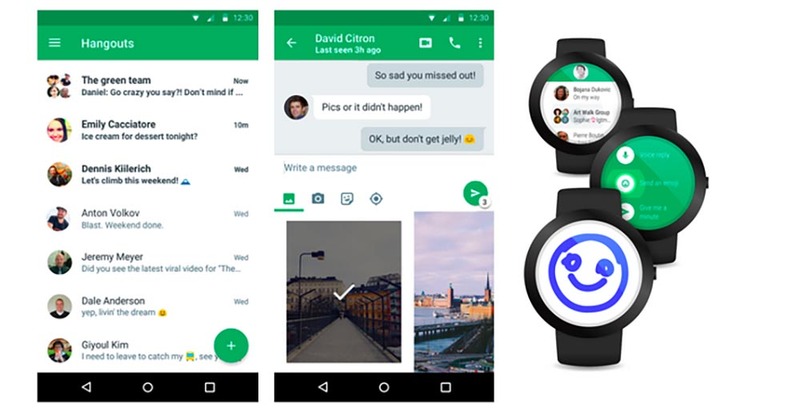 They also made it super easy to send Hangouts messages through Android Wear with your voice and brought back custom status messages. This is a big one. Hangouts is simpler. The new Compose button makes it easier for you to start a new group or conversation. Our streamlined contacts list helps you find the right person quickly. And attachments have been revamped and simplified, so sharing—of emoji, GIFs, your location, even multiple photos at once—is a snap. Hangouts is faster. Whether you’re sending a quick message or video chatting with family, you don’t want hold-ups. We’ve been obsessively fixing bugs and speeding up message delivery to make Hangouts faster and more reliable. Bonus: less battery consumption. Make affordable calls from the Hangouts Dialer, now with Outbound Caller ID (so your friends won’t get any more calls from the great “Unknown”).Use Hangouts on Android Wear when you really have an eye on the time (just say, “Ok Google, send a Hangouts message,” into your watch). Receive and reply to group MMS messages in Hangouts using Google Voice. Use Hangouts on Android Wear when you really have an eye on the time (just say, “Ok Google, send a Hangouts message,” into your watch). And if you’re not around but want friends to know what’s on your mind? Custom status messages are back. The update hasn’t hit Google Play just yet, but once it does, we’ll be sure to share that .apk. Update: Update just went live on Google Play! Update 3: Here are some additional details on group SMS as a Google Voice user.